Indonesia's national disaster agency has raised the alert for Mount Agung to the highest level after it started erupting early last week. A volcano on the Indonesian island of Bali is erupting for the first time in decades. And authorities fear a bigger eruption could be just on the horizon. On Monday, Indonesia's national disaster agency raised the alert for Mount Agung to the highest level. Bali's main airport was closed, and authorities ordered thousands of people living near the volcano to evacuate. Mount Agung started spewing clouds of thick ash into the air early last week. Loud explosions coming from the volcano could reportedly be heard miles away. 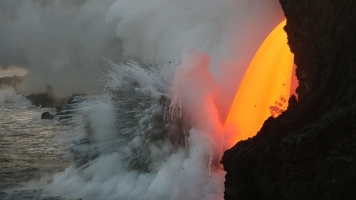 And a spokesperson for the disaster agency told reporters lava welling up inside the volcano's crater "will certainly spill over to the slopes." Experts say the volcano's recent activity is a sign that the potential for a larger eruption is imminent. But officials are urging people to follow their instructions and remain calm as they gather more data.